The Canadair CL-41 Tutor is a single-engine two-seat trainer and ground-attack jet aircraft produced by the Canadian manufacturer Canadair Ltd.. 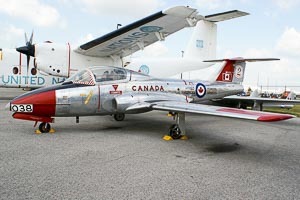 The CL-41 trainer was designated CT-114 Tutor in service with the earlier Royal Canadian Air Force (RCAF) and the Canadian Forces. The CL-41G Tebuan was delivered to the oyal Malaysian Air Force as a light ground-attack aircraft.